Last week we took a long (and I mean long journey) down the extreme southern part of Namibia to the town of Keetmanshoop (pronounced keyt-man-swoop) which is about 8-9 hours drive from CCF. We were attending the Museums Association of Namibia (MAN) Conference, but also got a chance to visit some of the sites in the area with the conference. The conference was really fascinating and there was really interesting discussions with some of other museums about how to help promote environmental and conservation issues into Namibia Museums. CCF has a nice museum dedicated to the conservation of the cheetah, of course, and it was nice to engage with other professionals about how we can improve our collection as well as how to collaborate with other museums. We also got a chance to visit a few of the amazing sites around Keetmans. The landscape around the southern area was so different from the rest of Namibia. As we drove south the grass grew browner and browner as the trees grew much more sparse. Once we stepped out of the car we noticed the amazingly dry hot air. Namibia is a dry country but it's crazy to feel the difference in dryness as you move about the country. Something about Namibia is that you will always be dry and somehow we're still surprised by this. The first stop we made in Keetmans was the Quiver Tree Forest which was only about 15km from the town. The forest is more of a privately owned farm that happens to have a dense selection of Quiver Trees open to the public along with some camping and accommodation. 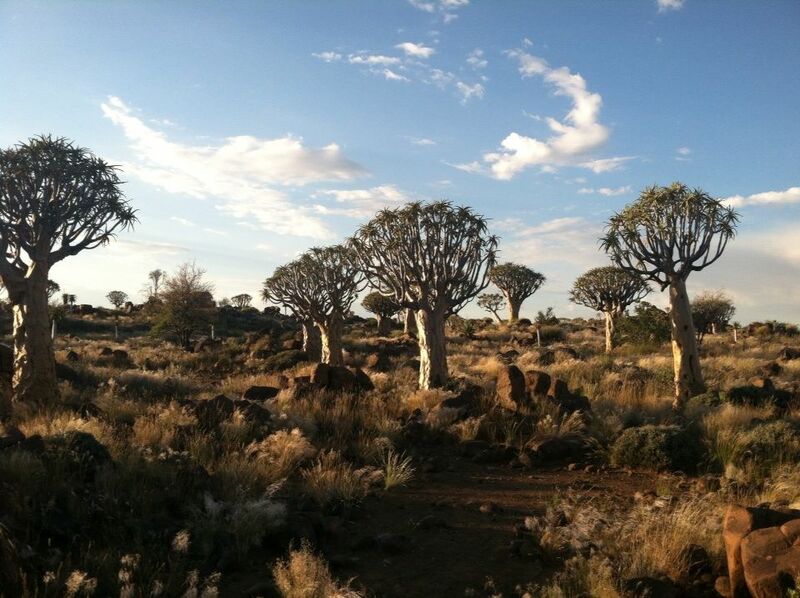 The Quiver Trees were very cool growing among the rocky and harsh landscape. Interestingly enough the trees are not trees at all but a type of Aloe plant that can grow up to 10-15ft. The trees usually occur very sparsely so this dense "forest" has become a hot spot in the area. Robert also got a chance to visit the Fish River Canyon which is considered the 2nd largest canyon in the world only to the Grand Canyon. The drive is about 2 hours from Keetmans and along gravel roads the whole way so its not exactly accessible, but once you get there the views are spectacular. The most amazing thing about the canyon is how remote it is. If this geographical site were in a more populated country I think it would feel very different. The fact that it is so remote makes a little bit more special I think despite there not being much to do around the canyon other than a convenience shop and a campsite. Everyone should have the chance to see a sight like this place even if it the journey may be long.